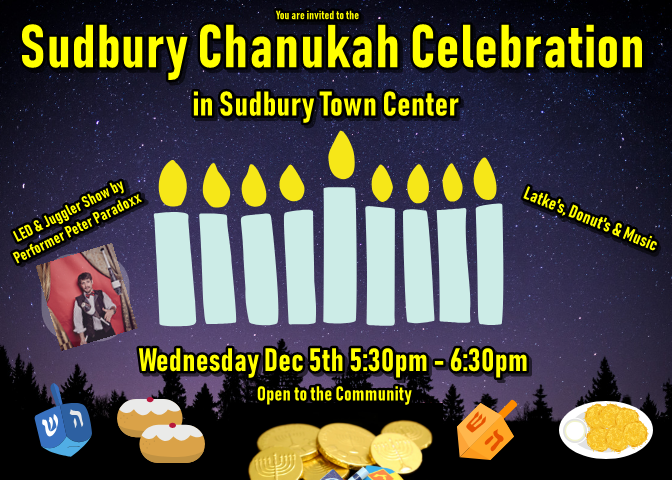 Join us in Sudbury's Historic Town Center for our annual celebration as we light up the nine foot Menorah and celebrate Chanukah and the Festival of Lights. Enjoy a special LED Juggling Show by Peter Paradoxx, Chanukah Music, lots of Chanukah treats like Latkes and Donuts and more. Wednesday Dec 5th 5:30pm - 6:30pm in front of Sudbury Town Hall. Yes I want to donate to Chabad of Sudbury and support its work in the community in honor of Chanukah.